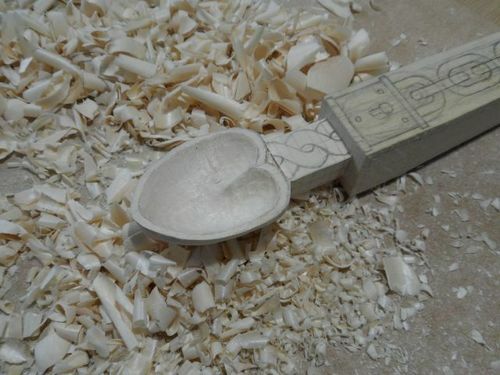 Now it is time to carve the bowl of the spoon. 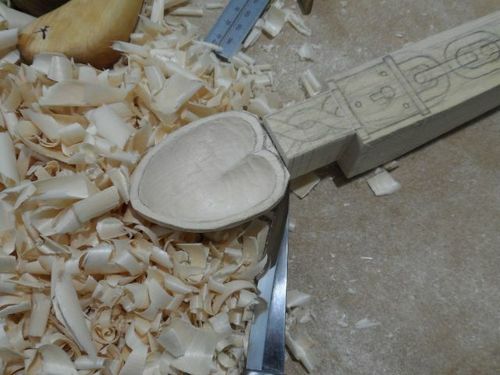 Since the top surface of the spoon bowl needs to be lowered somewhat and I will lose my drawing of the heart, I started by roughly shaping the perimeter of the bowl so I didn’t lose the shape. I also transferred my layout lines to the side of the spoon because I didn’t want to lose them either. 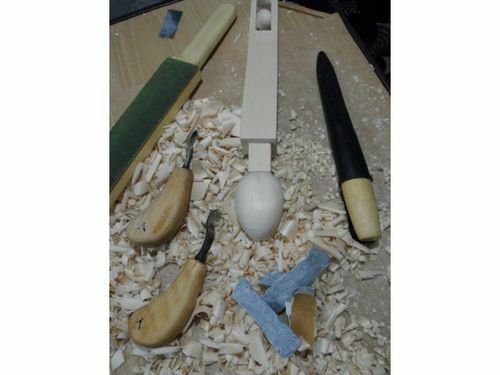 I will need to remove wood from the top, bottom and sides of the twisted stem section also to gain better access when shaping the underside of the spoon bowl. While I had the pencil in my hand I marked the height of each section on the side of the spoon for the first time to help me visualize the spoon in three dimensions. After roughing out the exterior of the heart shape, I pared the top surface down to its finished height and re-drew the heart on that surface. 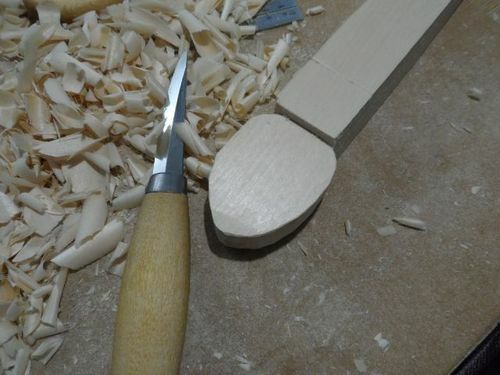 The underside of the spoon will also need to be pared down, but I decided to do that after I had gouged out the bowl as it would allow me to exert more pressure and not have to worry about anything breaking. 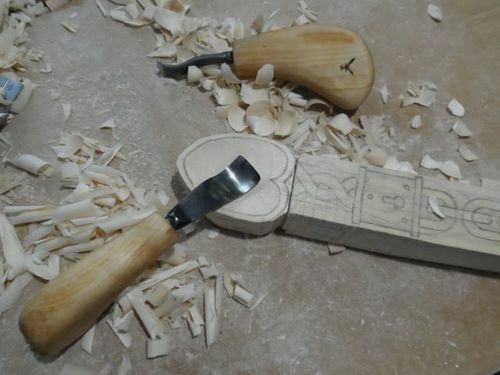 To carve the bowl I am using two Hans Karlsson palm gouges each with a different sweep. 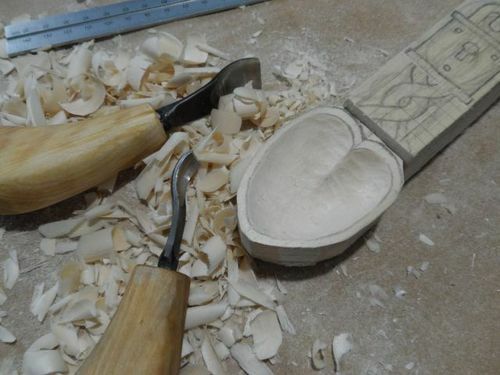 I also have a Hans Karlsson hook knife, but I felt the palm gouges would work better for a heart-shaped bowl like this. 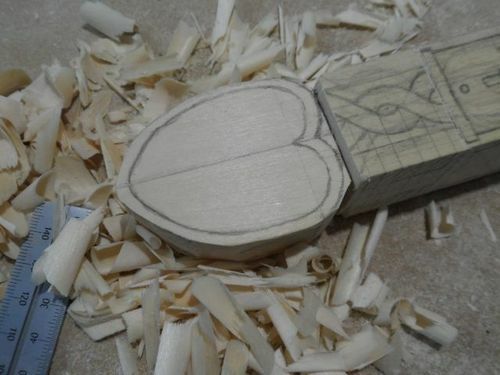 I started to remove wood trying to keep both sides of the heart even in depth and shape. I took care to leave a ridge top center to cast a shadow and add some visual impact. 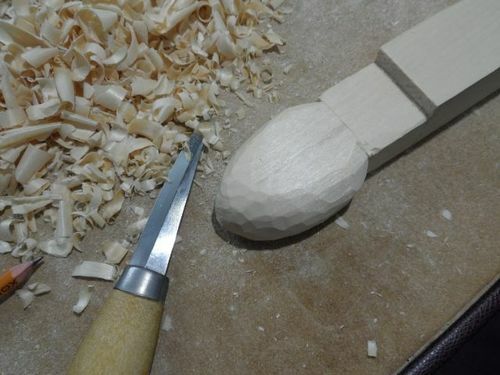 Having roughly shaped the bowl, I now turned my attention to the underside and pared that down to its finished height. Next I started to shape the underside of the bowl taking care to feel which way the grain was running and to work with it. 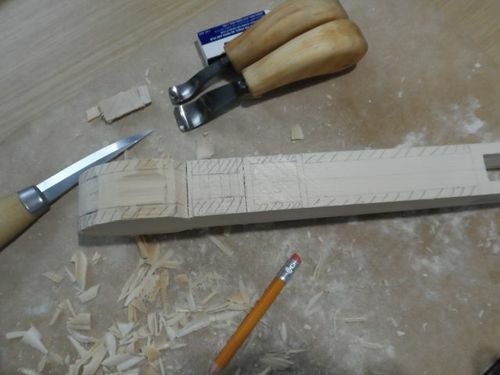 It is so easy to tear out a great chunk of wood when using lindenwood (basswood in the US) if you’re not careful and once it has gone you can’t put it back. To gain better access I pared the back surface of the twisted stem section too. ...and then the top surface. I then re-drew the twisted stem to give me a reference. All that was left to do was sand the bowl up through the grits starting at P120 grit and finishing at P800 grit. On the underside, I started at P80 grit. 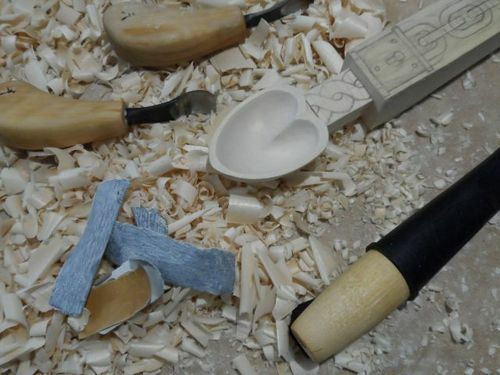 The underside of the bowl will be refined further once I’ve carved the twisted stem section of the spoon. In the next episode I’ll rough out the chain section and then work on the padlock. The twisted stem section is the most delicate area of the spoon, so I will tackle that last. 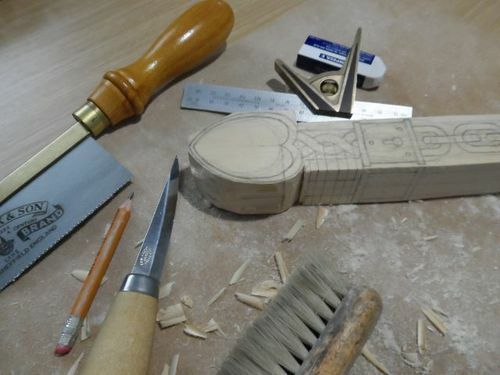 Wonderful work on this spoon so far Andy, I can’t wait to see it finished. Looks beautiful, Andy! Your work is always a cut above! Love the palm gouges…yes, I’m a tool geek. So very cool to see this come along. Are those few small strips the extent of the sandpaper you used? Tony – I used those thin strips for the bowl only and the P120 and P180 grits which are green in color are not shown there. For the outside, I used slightly bigger pieces folded in half to approximately 1 1/2” by 2 1/2” in size. You do wonderful work Andy. Does the hotel mind you leaving shavings on the floor.? Thanks for this great blog, Brit. It’s very interesting.